Here's a beautiful and sentimental Valentine's Day gift for someone you love. Be My Valentine, Charlie Brown is a 1975 television special which featured the great cartoons of Charles Schulz and all of the Peanuts gang. Your may wish to share this remastered deluxe edition DVD with your Valentine who may have watched it as a youngster or perhaps you may wish to share it with the younger members of your family and establish it as a tradition in their childhood. 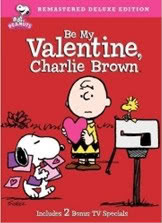 This DVD actually includes three Valentine's Day television specials ~~ Be My Valentine, Charlie Brown, It's Your First Kiss, Charlie Brown and You're in Love, Charlie Brown. Beautifully packaged and an affordable Valentine's Day gift available from Amazon by clicking right here. Alternatively, you can read more about the special and see more recommended Charlie Brown Valentine's Day gift ideas at my page, Be My Valentine, Charlie Brown Movie Review.